Generally loose for me, but I have been known to use a pressed with a powder brush. It gives a similar finish & feel, even on my dry skin! I pick pressed for convenience and I make a helluva mess with loose. My current favourite is Lacura from Aldi’s it’s actually really good! and Shiseido’s translucent pressed powder is gorgeous. I swatched the Aldi one in the shop and it felt so soft! I was really surprised. I don’t use face powders but I might give the Aldi one a go as it’s so cheap! Pressed powder for convenience. But I also notice that loose powder gives me a better even finish, mebbie because the time I use my pressed powder is the time I’m most rushed & not focusing much on my face. Lol! Loose! Much better on my dry skin in my opinion. Bit of a pain in the bum though. I love the Illamasqua one and I have a ancient Kryolan one I like a lot as well. For foundation, LOOSE! It looks better and is less likely to look cakey. For everything else, it’s a toss-up- although I generally prefer pressed blushes and loose mineral eyeshadows. I will always be a pressed powder fan because loose powder aggravates my asthma. I do wish I could try it though! i like both but last week i discovered MAC Studio Care Blend pressed which is amazing and very very fine. i find i use less with pressed, but the key is the applicator: MAC pro sponge puff things are genius and apply a mere trace of powder. I was a pressed lady until a week ago but now I am in love with loose powders. For super dry skin they just seem to work a heck of a lot better, and make me look a lot less like my nose needs a good deflake! I was told at the makeup course that loose powder is for setting liquid foundation and concealer, pressed powder is for touchups during the day only. I’ve found this piece of advice to be true. Sometimes, on lazy days, I use pressed powder instead of the foundation+loose powder combo, just to tame the shine. 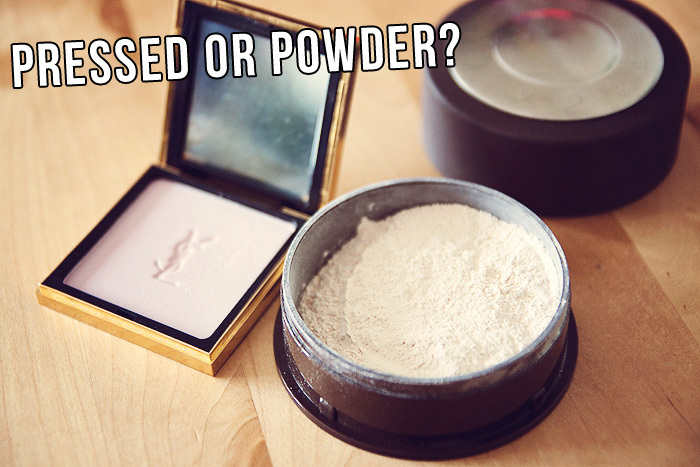 Of course loose powder would do that too, but I’ve chosen pressed one that gives a tiny bit of coverage too. Pressed but only because I have a 4 year old who knows where my make up is stashed. Bot! It depends on the need. If you’ve got a fairly heavy base tat needs to stay in place, I prefer to use a loose powder. You can press on the powder with a puff and brush off the remainder. If you’re using a light base and you just want to tone down the sheen, then a pressed powder is more appropriate because you just need a relatively small amount on your brush. Again, if you’re using a mineral base, you can get good coverage with loose and you can control the amount you need better than with pressed. However, because it can be messy, a pressed version is ideal for a touch-up (oh-err missus!). Alas, I’ve had to many lids come off with loose powders destroying my bags. I stick with pressed and a kabuki brush. I’m currently using Revlon’s PhotoReady Powder and love it. When it gets low and starts to crack I break it up into a makeup sift jar which I use at home but I have to keep a pressed on on hand to protect my bag!